The life force of the ocean, the quiet beauty in flowers and the tranquil coastal landscape have been Gobind's inspiration. It is her passion to bring forth the inner glow, energy and movement of her subjects on to canvas using layers of color and brushstrokes. As a contemporary painter she is inspired by old world masters such as Rubens and Vermeer as well a the impressionist painters such as Monet, Gauguin, and classical realist painters, Bierstadt and Waugh. Gobind grew up in a family that appreciated fine arts. As a California native she began painting the rolling hills of Southern California at an early age. She attended California State University Long Beach where she earned her degree in 1978 in Fine Art. After working several years as a graphic artist and fashion illustrator for retail advertising, she left in 1990 to raise her two children. Her painting time was scheduled around her mom activities and her work was sold at local stores. In 2004 she began to paint the sea in oil which she continues to do and studies with modern masters in a broad range of expertise. Although she has won several awards,that is not her goal. It is the hope that her paintings can be enjoyed in homes and businesses as dreams or memories of special places or events in someone's life. She prefers to paint directly from life and will spend hours observing and painting on location, bringing that knowledge back to her studio in Long Beach, California. Gobind's paintings offer peace and upliftment to a changing and chaotic world. Gobind has always had a love for the sea. 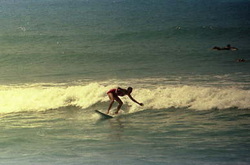 While studying art at California State University she also was learned how to surf from her husband . She had to learn how the currents flowed and the waves broke . That knowledge and experience of the power of the sea is the basis of her seascape painting. 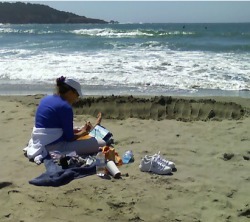 Her husband still surfs and is a good wave critic for her paintings. 2016 Finalist in LPAPA "Best of PLein Air"
2015 First place Rogers Gardens "Day of art in the garden"
2015Third place SCPAPA; "Light here, there everywhere"